The only way to know if a building is affected is to carry out a radon test using a special detector and radon test kit. PropertECO can supply inexpensive radon level detectors for home and workplace use that are analysed at an independent laboratory. This level of radon testing is vitally important to the health and wellbeing of all individuals who occupy the property as it can highlight potentially dangerous levels of this harmful gas enabling further action to then be taken to reduce the risks. We supply packs of 3-month detectors and 10-day screening detectors, which are useful if you are buying or selling a property. For a standard house, a kit of two detectors will be required so that one detector can be placed in a ground floor living room and one in a first floor bedroom. 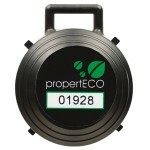 To read more about our radon test kits or to place an order, visit www.radonshop.co.uk. PropertECO are official UK stockists of the Canary Digital Radon Monitor, a battery-operated constant read radon monitor that gives you both long term and short term measurements of radon levels. We can also offer sophisticated electronic radon monitoring equipment for professionals, including the RadStar RS800i, the RadStar GM1-2 and the Canary Pro. Under health and safety legislation, a radon risk assessment should be carried out for every workplace. This risk assessment should include radon testing if the workplace premises are located in an ‘affected area’ or if the building has a basement. More information about employers’ responsibilities to manage radon in the workplace can be found in our Guide for Employers. The Health & Safety Executive (HSE) website also gives details on the legal duties employers have regarding employees’ exposure to radon. If high levels of radon are detected, propertECO can design and install specialist positive pressure ventilation and radon sump systems to lower the concentration and prevent future infiltration of the gas. With over 20 years of experience in the field of radon mitigation, our radon sumps and mitigation systems are designed on an individual basis depending on the size and layout of the property and the level of radon present. For more information on our mitigation services, please visit our Radon Mitigation page or contact us to arrange a survey. 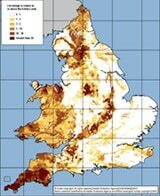 The radon map of the UK highlights the areas of the country where it has been predicted that high radon levels are most likely to be found. You can read more about the UK Radon Map by clicking on the map to the left and a detailed version can be downloaded from the Public Health England (PHE) website. This resource is based on estimates and data extrapolation, so we recommend that the best course of action is to use a radon detector kit to carry out an accurate assessment of radon levels in the air within your home or workplace.